OK, this isn't exactly one of my favorite things. I'm not exactly into watching space movies and didn't exactly like space toys either. Wasn't into the "Star Wars" figures thing. However, there is one space toy I would have liked to have had, had it come along before I out grew playing with toys. The toy in question came out when I was 16, in 1987. I remember seeing the commercial for this toy line, Spectra (made by Mattel), on a TV station from San Francisco, during a rerun of "The Brady Bunch." As I said earlier, I was 16 when this came out and way past toy age, but if I saw one today, I may buy it and start collecting them, something that might be difficult--if not impossible--to do. The dolls may be hard to find. In 2000, I picked up a copy of the book 30 Years of Mattel Fashion Dolls 1967-1997 [link], and upon seeing the listing for Spectra, I remembered this commercial. The book noted how Spectra was the first toy shown in the 1987 Mattel retailer catalog, and how she looked like she would be a hit. The line, however, was discontinued within a year, without even appearing in the 1988 catalog. Space toys must not have been hot in 1987. According to this page, Spectra was an attempt by Mattel to cash in on the success of Hasbro's rocker line Jem which had been released a year-and-a-half earlier, but that Jem had already run its course by then. And Mattel had already jumped on the Jem bandwagon with its Barbie and the Rockers line in 1986. 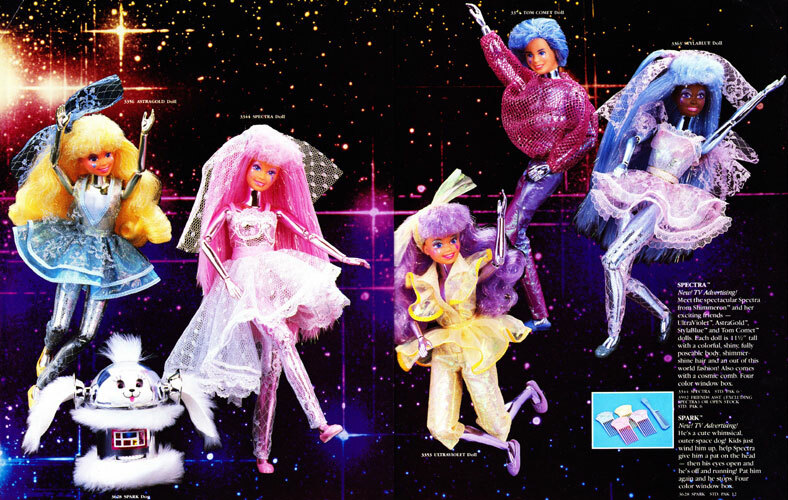 Even the Astronaut Barbie line didn't seem to help sell Spectra. Perhaps the space travel rage had already run its course by the tie Spectra was released, says the website linked above. This seems to have been the reason for Spectra's quick discontinuation. It may be interesting to note that shoes used on the dolls were recycled for Barbie's teen cousin Jazzie's line, produced between 1989 and 1992. A line of fashions for Jazzie and her friends included the Spectra shoes. This was noted in the Mattel book linked above. Can't seem to find any online info about this. The Spectra line form 1987 is not to be confused with a current Mattel character, Spectra Vondergeist, from The Monster High line. Quiz:Which Architectural Style Are You? Quiz: What Animal Were You in a Past Life? Quiz: Are You French Fries or Onion Rings?